It isn't impossible to keep ice from melting forever without putting it in a freezer, but you can use a few simple methods to keep it cold for longer and delay the melting. Ice, like all things, is made up of particles that react differently depending on the state they are in. A solid ice cube has a fixed shape with closely compact, fixed particles. When ice is taken out of a freezer, the warmer temperature gives the solid particles heat energy, which allows them to break apart from one another – melt – and gradually turn into liquid particles. Try these science project ideas to experiment with different ways of keeping the temperature surrounding the ice low to prevent it from melting quickly. To see how different materials affect the length of time ice takes to melt, put some ice in a plastic cooler and the same amount of ice in a metal cooler. Ice needs energy to melt, and plastic containers prevent the transfer of heat energy from the inside of the container to the exterior and vice versa. Metal coolers transfer energy more quickly, so they don't keep ice from melting for a long period. Try the experiment with different colored coolers. Lighter colors absorb less heat, which should keep ice cool for longer. Add another layer of insulation between the ice and any external heat by wrapping the ice cooler or bucket with a towel. A layer of packaging material between the cooler and the towel provides even more insulation. Trapping air between the layers reduces the amount of heat energy that is lost. Wrap a container of ice in a sheet of aluminum foil. Reflective surfaces preserve temperatures at a consistent degree, so the ice melts at a slower rate than ice that is left uncovered or covered in a sheet of a nonreflective material such as paper towels. Experiment with different sizes of ice cubes to determine how size affects the time it takes to melt. 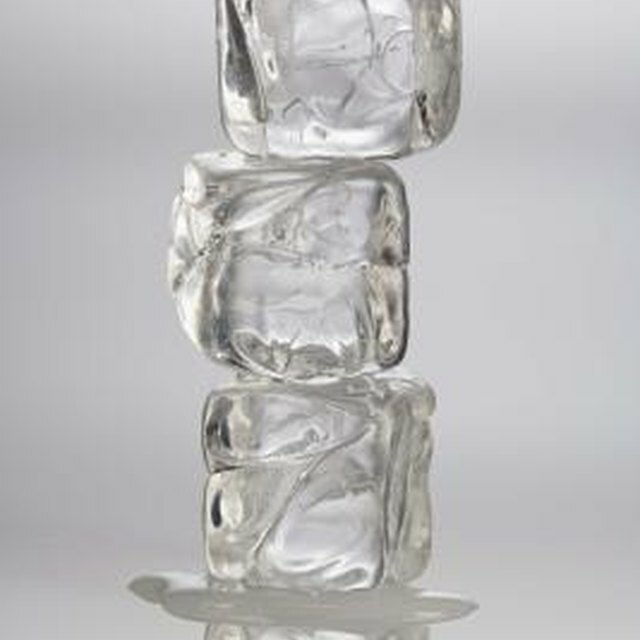 Larger ice cubes have a larger surface area, so they stay cold longer. Crushed ice melts faster due to the small surface area exposed to the surrounding heat as compared to its relative density. Also, using boiled water to make your ice cubes reduces air bubbles and keeps them cold for longer. The colder the area the ice is in, the longer it takes to melt. Place the ice beside a fan or air conditioning system. If the ice is in direct sunlight such as next to a window or near hot objects, it melts faster. The smaller the room the ice is in, the greater effect a drop in temperature has on its melting rate. UCSB Science Line: How Long Does It Take for Ice Cream to Melt in Room Temperature? Gillespie, Claire. "Science Projects: How to Keep Ice from Melting." Sciencing, https://sciencing.com/science-projects-keep-ice-melting-7932666.html. 29 April 2018.